ANYONE CAN EARN A LIVING WORKING FROM HOME. Learn How To Make Money Online & Boost your income! What will you receive with the Home Business Bundle? * Your own "e- learning or health supplement E-commerce webstore" loaded with online courses products and " FREE EBOOKS" provided by 24x7 E-University or health supplements product provided by Kokoshungsan Ltd.
1. 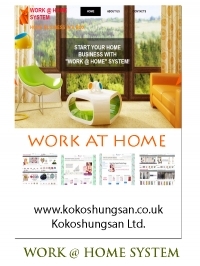 Start your home business with No Financial Outlay! NO inventory to keep! 3.Start selling our products within days with our ready-made website loaded with our products! 5.Add unlimited products to your store. 1.earn up 50% rewards from course or health supplement products . 2.earn 100% profits from 31 ebooks with MRR (give them for free or set up your own price). 3.Profits from your own products. Choose one webstore from below 2 business types! 2) You sell the item via your website for $15, and your customer pays you. 4) You place the order from us with your reseller account and we dropship the product to your customers directly. 5) You keep the $6 profit, without ever having handled the products. YOU HAVE 100% OWNERSHIP OF YOUR FULL WEBSITE, 100% right to Edit & Manager Your website via an easy-to-use admin panel. You can add unlimited products to the store! Lifetime hosting provided by KOKOS HOSTING (Value $188). No need to pay for hosting anymore, we will host your site as long as you want! Have your own webstore loaded with our products and ready to trade within days (depending upon our workload), with the ability to accept online payments. 5) Free Access to "Home Business Private Community"
Get free support, tips, bonus, tools..and many more by joining the private community. Start making money with a ready to go website. Join community to get free support, tips, bonus, tools...to help you success with your home business! Can I add my own products to sell only? Yes, you can do whatever you want with your own web store. You will receive a site that exactly looks like demo site. You can edit/manage it easily via an easy-to-use admin panel. If you don't want to resell the products installed in the site, simply move it. Will you give me a free domain name? No. domain is not included. Please register a domain from KOKOS HOSTING or any domain supplier you like. Will I really have free hosting to host my site for lifetime? Yes , we will host your site as long as you want. I don't like the free website, where can I find other online business model and buy the site I really like? The website we provide you is free, you don't have to take it if you don't like it. You can find many established websites for sale online such like ebay and Flipbz. Will you help me to promote my site? Yes, the 600+ online training courses will bring you some ideas regarding website promotion, SEO...etc. Also, the tips, tools...etc in the private community will help you to build a success online business. We also provide 24/7 email customer service to you answer any question you might have.